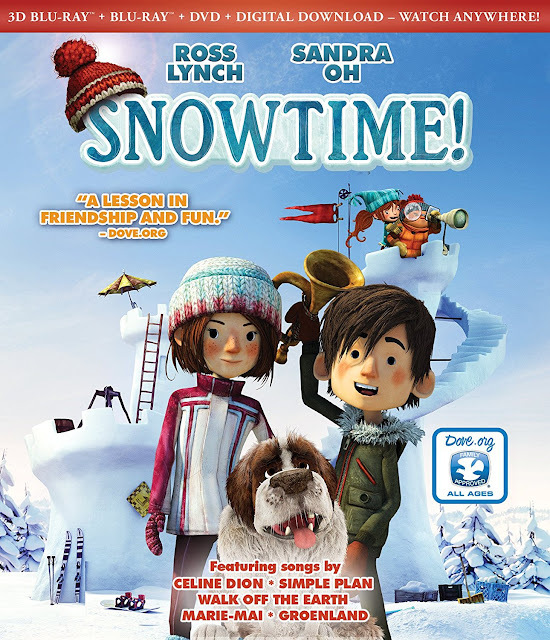 A romp through childhood full of heart and humor, the new animated feature Snowtime! 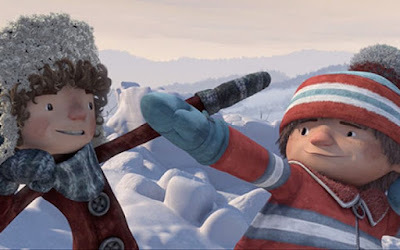 is a captivating cinematic adventure about the kids in a small village who decide to have a massive snowball fight to amuse themselves during the winter school break. Luke and Sophie, both 11 years old, become the leaders of the opposing sides. Sophie and her cohorts defend an elaborate snow fort against the assault of Luke’s horde. Whichever side occupies the fort at the end of the winter break, wins! But what starts out as pure youthful fun and enthusiasm deteriorates into a more serious conflict. 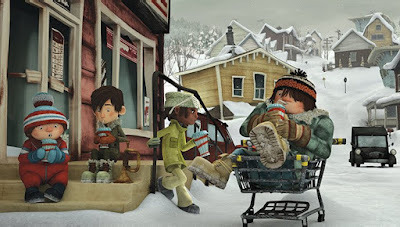 Can joy and peace be restored, or will the kids’ friendships fall in a flurry of ice and snow? 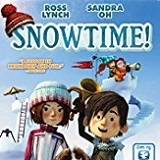 Featuring an all-star voice cast including Ross Lynch, Golden Globe-Winner Sandra Oh, Angela Galuppo, Lucinda Davis, Sonja Ball, Don Shepherd, Jenna Wheeler, Heidi Lynne Weeks, Elisabeth MacRae and Holly Gauthier, Snowtime also features songs by Celine Dion, Simple Plan, Walk Off The Earth, Marie-Mai and Groenland. Snowtime! is based on the movie The Dog Who Stopped the War, the first film in the "Anthology Tales for All." It is developed and produced by Rock Demers. None of that means much to me but they devote time to putting it on the screen, with a long enough pause to allow you to read all that, so I figure it might be important to some people. Two eleven year old boys look forward to winter break. The boys, Luke and Frankie, feel like they live in the best town ever, partly because of the tons of snow and the lack of girls. Two weeks without school for winter break will be full of epic fun in the snow covered town. Just as things are looking great, a new family with two young daughters moves to town. The girls aren’t happy either and by first glance the town appears infested with boys. Frankie is the fun friend. Luke is more of a loner, sitting alone playing his bugle. After a snowball fight with some first graders, Luke and Frankie decide to build snow forts. To combat the boredom, they will split into armies and have an all-out snowball war. They recruit their soldiers and draw up battle plans, taking the fight very seriously. On their way to prepare for battle, they meet the new girls in town. Frankie introduces himself as four eyes as he meets Sophie and her sister. Sophie soon becomes the leader of one of the forts. The children set the rules – they will fight only in daylight, enemies never talk to each other and the war will end on the last day of winter break. Although the snowball war was meant to amuse, things do get out of hand. Tragedy strikes as the children learn there are real life consequences to their pretend war. 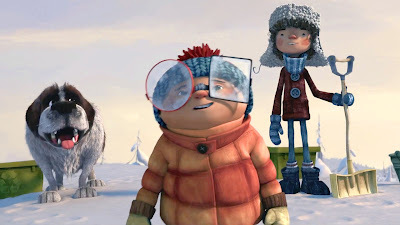 I’m always on the lookout for a new holiday film to watch with my son and I was very optimistic about Snowtime! even though I was completely unfamiliar with it. My son recently started playing the trumpet so I was very excited to see one of the main characters playing a similar instrument. 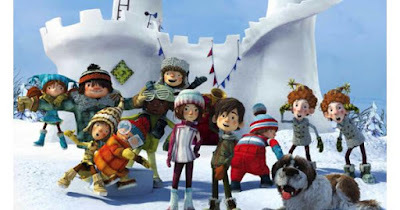 The animation is a different style than most of the films in our house and the characters are very cute. I thought for sure I had a winner. The voice acting is great and the story is fun. About half way through, we learn that the bugle was given to Luke at his father’s military funeral. It sure takes a fun, happy film to a darker, sad place but after the flashback its back to fun in the snow. I have always complained that many children’s films include dead family members or other sad plot twists that I don’t think are necessary. Snowtime! is available in 3D and 2D on the same Blu-ray disc. It's fun to see the snow flurries and watch the snowballs fly in 3D but you won’t feel like you are missing anything when watching the 2D version. In both versions, the tire tracks in the snow are visible, dirty and clean snow are discernable and the kids’ faces have pale red cheeks from the cold. The detail in furry jackets and strands of hair is a bit finer in 2D. The flecks of light in the characters eyes makes them more authentic and feel real. The film has a unique look to it, like it came from a storybook and memories are from beautiful paintings. There is much more to look at and notice in this film, than I expected. The DTS-HD Master Audio 5.1 mix is well balanced and prioritized. The music is a very important aspect of the mood and feeling of the film. The snowballs land with appropriate weight but I expected a bit more feeling of directionality. Dialogue is even and consistently legible throughout the film. Luke’s bugle playing does have the clarity to sound like he’s standing in your living room. Interview with Celine Dion – Celine Dion talks about having her children view the film, recording her song and her favorite characters. Interview with Sandra Oh – The voice of Frankie, Sandra Oh talks about his personality, the message of the film and whether or not she feels like they have qualities in common. Interview with Ross Lynch – The voice of Piers, Ross Lynch discusses voice acting, and comparisons to singing. He recounts his own experience in Colorado, building forts as a child. Interview with Producer Marie-Claude Beauchamp – With English subtitles, the producer gives a few words about her favorite scenes and what the film means to her. Musicians Promo – Snippets from each artist whose music is included in the film: Marie-Mei, Groenland, Walk Off The Earth, Simple Plan, and Celine Dion. If it weren’t for the needlessly (in my opinion) sad parts, I would be praising every bit of this film. I don’t understand why it can’t be entertaining to watch a bunch of kids go to war. The forts are fun and full of unrealistically complicated attributes, and I’m okay with that. This would have been a great movie if the kids didn’t have a care in the worlds, except wining the snowball war. The film has been praised for its lessons, but I don’t feel my family needed these lessons. Common Sense media was quoted as saying its “funny and entertaining for both parents and kids”, which is true. They also should have pointed out its pretty darn sad too! I feel like you should know that going into it. This film might leave your child in tears. I can’t honestly decide whether or not to recommend this or not. I guess everyone should see for themselves and decide how their children will react.